Whitekirk, as it may have been in 1500 (a stronghold of the Sinclair's). As visitors pass through the small East Lothian village of Whitekirk attention is always drawn to the historic medieval church, originally a parish Kirk of Holyrood Abbey. People tend to ignore the tithe barn on the hill behind as uninteresting and unhistoric! However, appearances can be deceptive and on closer inspection what appears to be a rather dull looking 17th century crowstepped gabled barn conceals in it's west facing gable the basement of an earlier towerhouse raised by the Sinclair family around 1540. The Sinclair family had three Lothian Branches of note, the Sinclairs of Roslin Castle and chapel in Mid Lothian, who in 1330 accompanied the 'Good Sir James' Douglas with King Robert the Bruce's heart (1306-1329)on a pilgrimage to the holy lands. Unfortunately they only got as far as southern Spain where both the Sinclair's and the Douglas were killed at the battle of Teba, beside the castle of the Star. Bruce's heart was later recovered, taken home to Scotland and buried below the high altar of Melrose Abbey. The second family of note were the Sinclairs of Herdmanston Castle near Haddington, who in 1388 carried the Douglas banner to victory over the Percies at the battle of Otterburn near Newcastle. And finally the Sinclairs of Whitekirk. Whitekirk castle itself was constructed on top of the foundations of pilgrims hostels built by King James l of Scots (1406-1437) who gave the church his personal protection, since it had become world famous because of the alleged healing qualities of it's miraculous holy well. In 1413 for example over 15,000 pilgrims visited the site. Over the years many famous pilgrims traveled to Whitekirk, Black Agnes the defender of Dunbar castle in 1338,Aeneas Silvius Piccolomini (later Pope Pius ll), King James IV and King James V who in 1537 granted the pilgrims hostels to his favourite Oliver Sinclair who surprisingly demolished them to build his towerhouse of Whitekirk castle. This should have upset the holy church, but since 'William Sinclare' and 'Patrick Sinclare' served as vicars of Whitekirk church in the 1540's and probably kin to Oliver he escaped the wrath of the church and continued to have the support of James V. Many Scots lords despised Sinclair because of this relationship as he appeared to have the church and the King on his side and could do no wrong. In 1542 Oliver Sinclair marched south with James V's army to attack the west march of England. James at the insistence of his lords remained at Lochmaben castle as his father James IV had been killed at the battle of Flodden leading from the front in 1513. So command would devolve to Lord Maxwell, but James did not trust the Maxwells and gave secret orders that Oliver Sinclair assume leadership once the army crossed into England. As the Scots army of 10,000 crossed the marshes of the Solway Firth, they were met and engaged by the 3,000 lancers of Sir Thomas Wharton from Carlisle castle. During this initial indecisive skirmish Maxwell began barking out orders forming defensive ranks. At this totally inopportune moment Sinclair decided to announce that he was overall commander with the King's blessing, much to the disbelief and disgust of the other Scots leaders who began brawling with Sinclair's lackies and each other. So in one foul swoop Sinclair did more damage than any cavalry charge by destroying what little unity and morale the Scots held. Lacking leadership various units fought the English independently. But over 1,000 Scots in the confusion simply surrendered resulting in a disasterous defeat - another Flodden. With this sad news King James a sick, broken man fled north to Falkland Palace, where several days later he died hearing his wife had given birth to a daughter Mary and not a son, since a son was required for these troubled times as a figure head for the Scots lords to rally round. In 1543 King Henry VIII (1509-1547) of England sought the infant Mary Queen of Scots' hand in marriage to his son Prince Edward. When diplomacy and bribes failed to bring about this union in 1544 he sent the Earl of Hereford north with fire and sword thus the wars of the 'rough wooing' began. Whitekirk castle was burnt along with many other Lothian castles including Roslin which was bombarded into submission. Whitekirk castle and it's barmkin wall were later repaired by the Sinclairs only to be burnt again by the invading English in 1548 while they built a garrison fort at Haddington. Herdmanston castle was also seized and garrisoned after having resisted an earlier lengthy bombardment. The Sinclairs failed to rebuild Whitekirk castle in 1549 when the 'rough wooing ' wars ended with the English withdrawing from Haddington. During Cromwell's sacking of Lothian castles in 1650-51 no mention is made of the castle as it had already, like the hostels before it, been used as a quarry then rebuilt as a barn. The Kirk though is mentioned as being used by Cromwell as a stable for his horses while his men attacked Tantallon castle, near North Berwick. Surprisingly the Kirk survived these destructive times out-living the holy well and the castle only to be burnt by the suffragettes in 1914,but was later carefully restored. So there is alot more to Whitekirk village than meets the eye not only did it have a castle, a holy well and a Kirk but it also had many famous ancient visitors, three Kings, a Pope and even Cromwell. 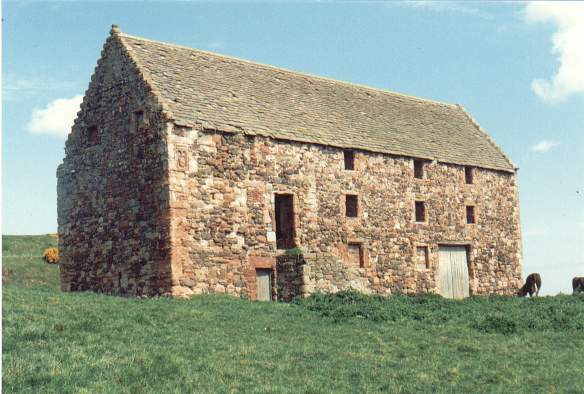 Whitekirk Tithe Barn: Whitekirk tithe barn (site of the original castle) before it was rebuilt as a house. The stump of the original tower is on the left hand side of the photo. 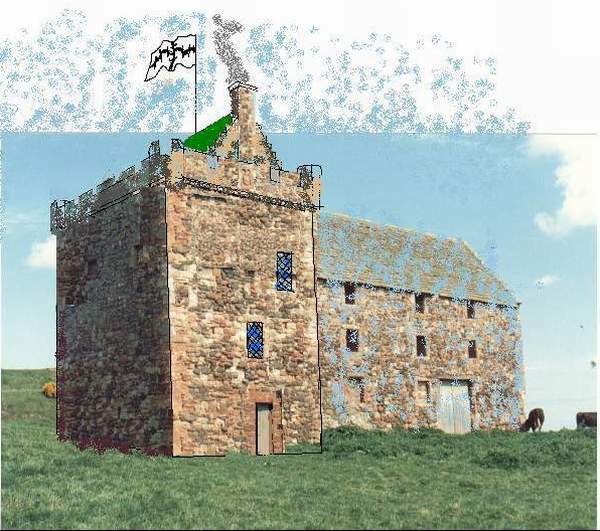 Here is Andrew's "reconstruction" of the barn overlaid as the Castle: Whitekirk Tithe Barn Reconstruction Pretty neat, Mr. Spratt!